The AP Chemistry exam will test your knowledge of basic lab techniques, as well as your understanding of accuracy and precision and your ability to analyze potential sources of error in a lab. In this section, we will discuss safety and accuracy precautions, laboratory equipment, and laboratory procedures. Here are some basic safety rules that might turn up in test questions. · Don’t put chemicals in your mouth. You were told this when you were four years old, and it still holds true for the AP Chemistry Exam. · When diluting an acid, always add the acid to the water. This is to avoid the spattering of hot solution. · Always work with good ventilation; many common chemicals are toxic. · When heating substances, do it slowly. When you heat things too quickly, they can spatter, burn, or explode. Here are some rules for ensuring the accuracy of experimental results. · When titrating, rinse the buret with the solution to be used in the titration instead of with water. If you rinse the buret with water, you might dilute the solution, which will cause the volume added from the buret to be too large. · Allow hot objects to return to room temperature before weighing. Hot objects on a scale create convection currents that may make the object seem lighter than it is. 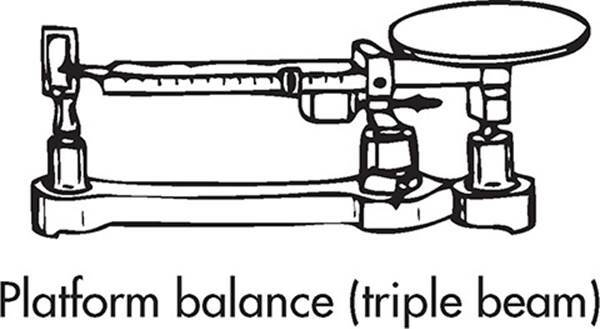 · Don’t weigh reagents directly on a scale. Use a glass or porcelain container to prevent corrosion of the balance pan. · When collecting a gas over water, remember to take into account the pressure and volume of the water vapor. · Don’t contaminate your chemicals. Never insert another piece of equipment into a bottle containing a chemical. 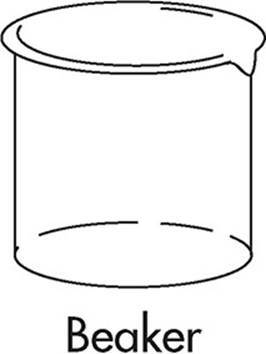 Instead you should always pour the chemical into another clean container. Also, don’t let the inside of the stopper for a bottle containing a chemical touch another surface. · When mixing chemicals, stir slowly to ensure even distribution. · Be conscious of significant figures when you record your results. The number of significant figures you use should indicate the accuracy of your results. · Be aware of the difference between accuracy and precision. A measurement is accurate if it is close to the accepted value. A series of measurements is precise if the values of all of the measurements are close together. When taking measurements in lab, your measurement will always have a certain number of significant figures. For instance, if you are using a balance to measure the weight of an object to the hundredths place, you might get 23.15 g. That number has four significant figures. The balance is no more accurate than that; you can not say the mass of the object is 23.15224 g.
It’s important to be able to identify the number of significant figures in any number given to you on the AP exam. There’s a plethora of information on ways to count significant figures out there, but we’ve reduced it to two simple rules. 1. For numbers without a decimal place, you count every number except for trailing zeroes (those which appear after all non-zeroes). So, 100 mL only has one significant figure, and 250 mL has two. On the other hand, 105 g has three significant figures—the zero in that measurement does not trail all other numbers. 2. For numbers with a decimal place, you count every number except for leading zeroes (those which appear before all non-zeroes). The number 0.052 has 2 significant figures, but 0.0520 g would have three (trailing zeroes DO count in numbers with decimals). Most (but not all) values you get on the AP exam will have decimal places. This leads to numbers that otherwise might look very strange. For instance, it is not unusual to see numbers with a decimal at the end but no numbers past it. That’s because a number like 100. g has three significant figures, but 100 g only has one. In science, 100. g is not the same as 100 g, which is also not the same as 100.0 g. All of those values have different numbers of significant figures, and that implies different levels of accuracy. Significant figures only apply to measurements with units; pure unitless numbers (such as those you find in math) do not follow these rules. Nonetheless, many math books do have units on practice problems and then ignore significant figures. Yes, it’s wrong to do that, but don’t tell your math teacher. is wrong. Your two measurements have three significant figures and two significant figures, respectively. Your answer cannot have five. It has to have only two because that’s how many figures your least accurate measurement had. The correct answer is 0.21 g/cm3. is wrong. Your values have three figures after the decimal and one figure after the decimal, respectively. Your answer cannot have more than one figure past the decimal, because that’s how many figures your least accurate measurement had. The correct answer is 13.5 cm. On a side note, counting numbers are considered to have an infinite number of significant figures. If you are doing a molar mass conversion and you identify the conversion as 22.99 g of sodium = 1 mol of sodium, your eventual answer will have four significant figures. That 1 mol representsexactly 1 mol of sodium, which is essentially a 1 with an infinite number of zeroes past the decimal place. This will usually come up when dealing with stoichiometry—the coefficients in a balanced equation are counting numbers of moles and don’t count when considering the number of significant figures your answer should have. You should get into the habit of making sure your calculations always have the correct number of significant figures as you do them, both in labs and on any practice problems you do in class. The AP exam may have questions on significant figures in a lab and they are typically integrated into the free-response section. Additionally, you may lose points for the incorrect number of significant figures when you do calculations. Along with making sure you have the correct units on your number, making sure you do your calculations to the correct number of significant figures is a good laboratory practice. Filtration—In filtration, solids are separated from liquids when the mixture is passed through a filter. Typically, porous paper is used as the filter. To find the amount of solid that is filtered out of a mixture, the filter paper containing the solid is allowed to dry and is then weighed. The initial weight of the clean, dry filter is then subtracted from the weight of the dried filter paper and solid. Distillation—In distillation, the differences in the boiling points of liquids are used to separate them. The temperature of the mixture is raised to a temperature that is greater than the boiling point of the more volatile substance and lower than the boiling point of the less volatile substance. The more volatile substance will vaporize, leaving the less volatile substance. Chromatography—In chromatography, substances are separated by the differences in the degree to which they are absorbed onto a surface. The substances are passed over the absorbed surface, and the ones that stick to the surface with greater attraction will move more slowly than the substances that are less attracted to the surface. This difference in speeds separates the substances. The name chromatography came about because the process is used to separate pigments. Titration is one of the most important laboratory procedures. In titration, an acid-base neutralization reaction is used to find the concentration of an unknown acid or base. It takes exactly one mole of hydroxide ions (base) to neutralize one mole of hydrogen ions (acid), so the concentration of an unknown acid solution is found by calculating how much of a known basic solution is required to neutralize a sample of a given volume. 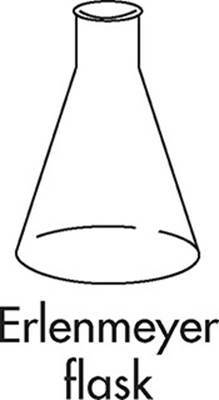 The most important formula in titration experiments is derived from the definition of molarity. As a quick reminder, the molarity equation is reproduced below. The moment when exactly enough base has been added to the sample to neutralize the acid present is called the equivalence point. In the lab, an indicator is used to tell when the equivalence point has been reached. An indicator is a substance that is one color in acid solution and a different color in basic solution. Two popular indicators are phenolphthalein, which is clear in acidic solution and pink in basic solution, and litmus, which is pink in acidic solution and blue in basic solution. Spectrophotometer—A spectrophotometer measures slight variations in color. It can be used to measure the concentration of ions that produce colored solutions. 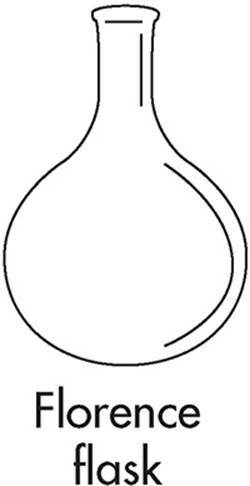 One of the most useful ways of identifying unknown ions in solution is precipitation. You can use the general solubility rules you know, or those given to you for a particular problem, to see how the addition of certain ions to solution will cause the specific precipitation of other ions. For instance, the fact that BaSO4 is insoluble can be used to identify either Ba2+ or SO42− in solution; if the solution contains Ba2+ ions, then the addition of SO42− will cause a precipitation reaction. The inverse is true for a solution that contains SO42− ions. In the same way, the insolubility of AgCl can be used to identify either Ag+ or Cl− in solution. You can tell whether a solution contains ions by checking to see if the solution conducts electricity. Ionic solutes conduct electricity in solution; covalent solutes do not. Remember, the more ions there are present in solution, the higher the conductivity of the solution will be. Also, the more ions there are in solution, the higher the conductivity will be. 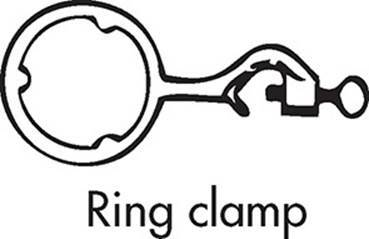 NaCl dissociates into two ions, Na+ and Cl−. A solution of NaCl will have a lower conductivity than a solution MgCl2, which dissociates into three ions-one Mg2+ and two Cl−. Conductivity can also be used to identify strong acids. A strong acid dissociates completely, and thus will have a much higher conductivity than any weak acid, which generally experience less than 10% dissociation. Some ions burn with distinctly colored flames. Flame tests can be used to identify Li+ (red), Na+ (yellow), and K+ (purple), as well as the other alkali metals. The alka-line earths, including Ba2+ (green), Sr2+ (red), and Ca2+ (red) also burn with colored flames. The following images show some standard chemistry lab equipment. Used to hold and pour liquids—also your favorite muppet. Used to add small but precisely measured volumes of liquid to a solution. 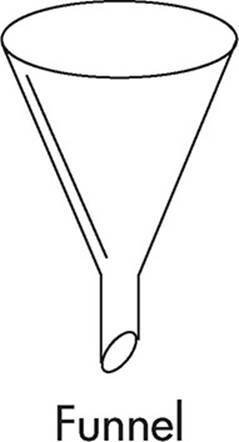 Burets are used frequently in titration experiments. Used to apply heat and to wake up sleeping AP Chemistry students. Used to handle objects that are too hot to touch (careful though, they can break test tubes!). Used to add small amounts of liquid to a solution, but only when a precise volume is not needed, because the drops themselves should be consistent only for one particular dropper (for example, adding an indicator, comparing the amount of drops of strong acid or base needed for a pH change in different solutions). A flask used for heating liquids. The conic shape allows stirring. 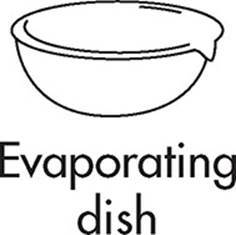 Used to hold liquids for evaporation. 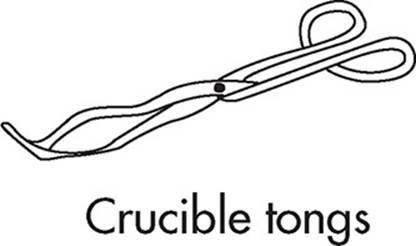 The wide mouth allows vapor to escape. 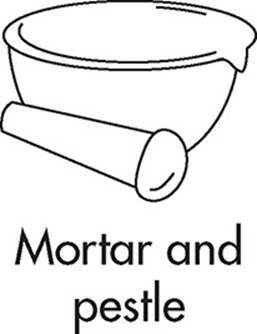 Used for boiling of liquids. The small neck prevents excessive evaporation and splashing. A fancy name for tweezers. Used to get liquids into a smaller container. Doubles as a cute hat when inverted. Used for measuring precisely a volume of liquid to be poured all at once (rather than dripped from a buret). Used to transfer small and precise volumes of liquid from one container to another (the gradations indicate the volume). Used to scoop and transport powders. Used to grind solids into powders suitable for dissolving or mixing. 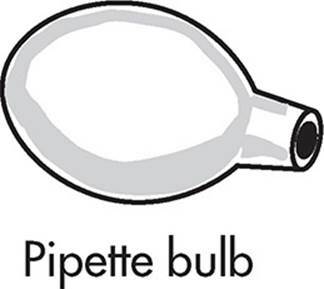 Rubber bulb used to draw liquid into pipette. In a pinch, could be used as a miniature clown nose. Rear weight is in the notch reading 30 g.
Middle weight is in the notch reading 200 g.
Front beam weight reads 3.86 g.
The sample weighs 200 + 30 + 3.86 = 233.86 g.
Used to hold funnels or other vessels in conjunction with a stand. A hard tipped rubber scraper used to transfer precipitate. 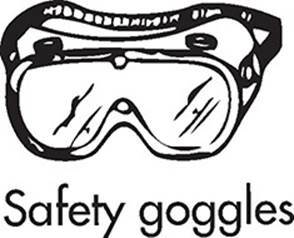 Used by chemists to protect their eyes during all laboratory experiments. Used to contain samples, especially when heating. Sometimes babies come out of them. Measures temperature of a solution (don’t use these to measure your body temperature, you don’t know where they’ve been). Used to transfer small amounts of liquid. The big difference between a graduated pipette and a volumetric pipette is that the volumetric type is suited for only one particular volume. Because of this, they are extremely accurate.